Paper dolls are a timeless toy. They have been around for centuries, but were popularised in the early 1800s. I don’t think there would be many of us who wouldn’t remember playing with them as children. My children love them. Of all the wonderful things on the Activity Village website, it’s the paper dolls that my kids consistently request, and it’s the activity that they spend the longest playing with. One set of paper dolls leads to hours of play. It makes them great value. All that’s required is a few sheets of paper, a printer, some coloured pencils, and a pair of scissors. Most of the dolls are available in black and white, for you to colour in yourself, or in colour to just print, cut and play. Sometimes we laminate them. Often the kids use blu-tak to stick the clothes to the characters, but you could leave old-style tabs when you cut them out, then fold them over. Or you could glue sticky notes onto the backs of the clothes, leaving the sticky surface to stick to the doll. Sometimes my kids like to reinforce the dolls with skewers stuck to the backs, but you could also print them out onto cardstock for greater durability. My kids made the princess dolls, and my oldest daughter spent ages and ages colouring them in beautifully. It’s nice now that she’s old enough to do the cutting out by herself! We laminated these ones, so they should last for ages. There are school uniform dolls, which could be done in your kids’ school colours if they want to. They would be great for decorating school folders or books. We home educate, so my Enid Blyton fan-girls had fun making up boarding school uniforms for their dolls – they love the Enid Blyton school series! Some of the biggest hits were the Royal Wedding dolls. There are William and Kate and Harry and Meghan dolls, and a selection of clothes for them. My kids had a lot of fun colouring these in and designing bright clothes for them to wear. Harry and Meghan's walk-in wardrobe! They then went one step further and created houses for them to live in. They cleared off some cubes on their cubic bookshelf and used the cubes as rooms. The dresses and suits were hung up on the wall, portraits were made and stuck up, even a calendar was made! They were so creative in the way they played with them. The play went on for days. I loved sneaking in and watching them! Royal outfits for royal duchesses! 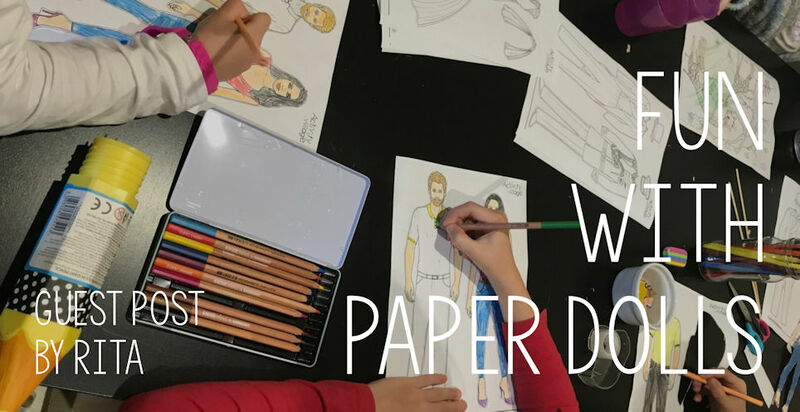 If you haven’t tried any of the paper dolls on Activity Village yet, you definitely should. They are perfect for this time of year, on a dull rainy January afternoon. They would be a great toy to take away on holidays to fill in quiet moments. They would work for entertaining kids who are unwell, or for calm, quiet play before bed. You could make them with friends and swap clothes, or design your own outfits and accessories to go with them! This is a guest post from Rita. Rita is a home educating mother of four girls, aged 11, 9, 7, and 3. She blogs at Chronicles of a Disorganised Homeschooler, where she shares her attempts to at least pretend to be organised enough to manage life, and the fun that she and her family have along the way. You can find a list of all our guest posts, here.